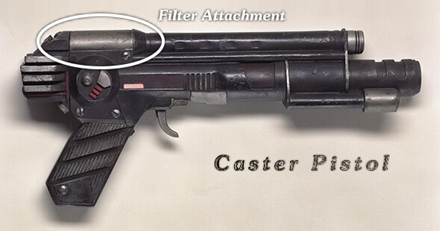 An extremely rare item, the Caster Gun is the product of some very old technology. Instead of firing normal bullets, it fires projectiles called Caster Shells. There are twenty different types of Caster Shells, and each one has a different use. The Caster Gun is a mixture of science and sorcery. What is actually contained in the Caster Shells are potent magic spells. When fired, the spells inside the shells are activated by the life force of the person firing the gun. As some of the spells are quite powerful, they draw a large amount of energy, and using several in succession has proven fatal. Caster shells are the key element to any caster weapon. Without the shells, a gun is worth nothing more than a pretty paper weight. Twenty different types of casters exist. Each one has its own unique form of energy pattern that it puts out. Some shells release a focused beam of energy while others put out massive blasts of it. Caster shells are expensive and rare. 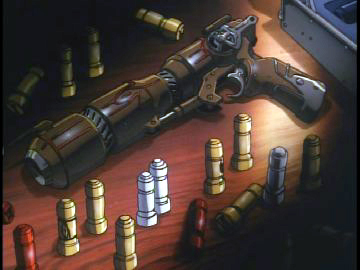 They, like their counterpart, the caster gun, are considered by most to be outdated technology. However, because casters are based on an entirely different technology, they prove to be an effective means against those who use Tao magic. Since the Caster Gun is a rather uncommon piece of technology, finding shells for it is often very difficult. As a result, Jim is constantly reminding Gene to use them sparingly. 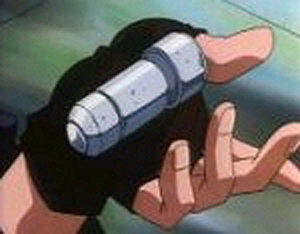 Yet, despite the dangers and the difficulties involved with using the Caster Gun, Gene still finds it to be his weapon of choice, and it has helped him survive numerous difficult confrontations. Copyright © 2004-2007 JapaneseAnimeUK! Co., Ltd. All Rights Reserved.